Co-Founder Matthew sharing a story about when he learned that turning the other cheek is actually an act of resilience and resistance, not cowardice. But he also asks: who is getting the most slapped in the face? It’s certainly not him…. From Just Speak, Incorporated‘s Starting Point Event at Red Bull Radio, Detroit, November 27, 2018. Friends, this is our final post for #AntiRacismForLent 2018. Thank you for undertaking this journey with us, and all our posts and content will be accessible here: Repenting Of Racism For Lent. Most importantly, this is only a beginning, but hopefully it has inspired a new perspective and posture on learning, confessing, repenting and taking daily steps to work towards dismantling systemic racism and classism. We confidently believe it is in line with Jesus’ teachings. We pray and hope this spurs all of us towards greater awareness and action. Please listen to Luke, Maddie, and Matthew reflect on the last 40 days, and look back over posts that they created with Lauren Grubaugh, Lydia Lockhart, Daniel Russell, and Meggie Anderson-Sandoval. If you’ve learned something from these past 40 posts, please share them far and wide with love, with hope, and with earnest expectation that we will understand God more when we learn to love one another ever more deeply and ever more truly. May your Easter be filled with a sense of hope and possibility that Christ died and rose again for every single one of our lives, every single one of our beautifully diverse bodies and souls, and that we can celebrate the good, good work of getting to know the Kingdom here on Earth every single day. Co-Founder Matthew is serving as a Challenge Detroit Fellow for 2017 and 2018 with 25 other entrepreneurs in the city. This week, his work is being highlighted here, copied below. Tell us about one of your favorite neighborhoods in Detroit and what makes it unique? In 2016, we packed up our life and moved back to Detroit from Los Angeles. Darcie and I had been feeling increasingly called to move back, so we took a leap of faith with our two daughters. I had grown up in the suburbs, at 13 Mile and Southfield, and had always loved spending time in the city, mostly downtown and Southwest. Knowing that one of our deepest longings was to live in closer context with neighbors, and that our girls would be raised in a diverse community, both socio-economically and racially, friend after friend kept pointing us towards the 48214 zip code and the Mack Avenue Church community. For about 8 months, we rented an apartment in Pingree Park and worked jobs with Lyft, The New Teacher Project, and Citizen Detroit. And then in May of 2017, we were able to buy a home for our family of four, just a block away. We have been blown away by the kindness and intentionality of our neighbors, both from within and outside of the church. 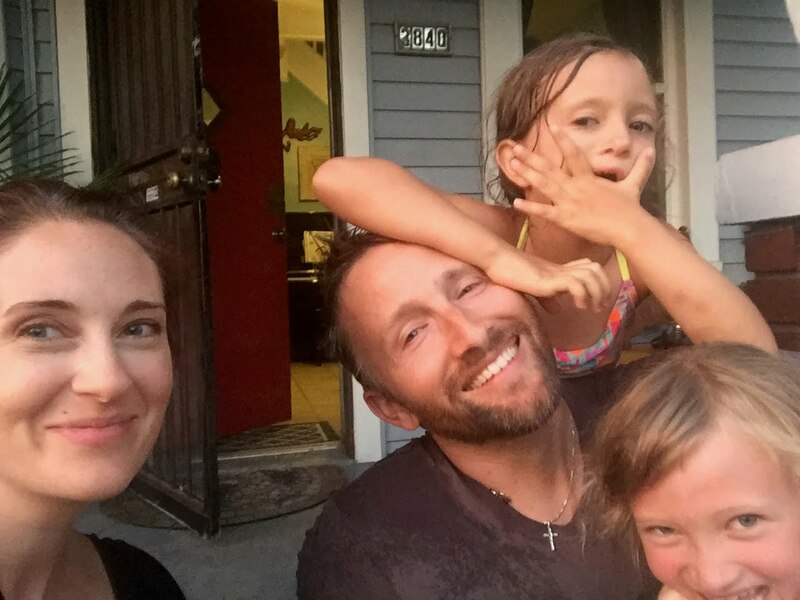 Sitting on our porch swing, walking to the park, clearing out overgrowth in alleys, and even having to get up early to shovel snow has provided a tapestry of invaluable moments connecting to families and people who’ve lived here for decades. MACC Development, the CDC of our church, has just opened The Commons, the first laundromat/coffeeshop/tutoring/ community gathering space at the corner of Van Dyke and Mack. It’s only been open for two weeks, but already I’ve caught conversations about the pros and cons of charter and public schools; a hearty Kendrick vs. Tupac debate; and a sustained celebration of the new Black Panther movie. All over the low buzz of laundry and espresso machines doin’ their thing. Tell us about the challenge project you’re currently working on, what are you learning from the experience? Currently, my team and I are working with the Detroit Land Bank Authority to help them streamline the process of selling vacant lots to community partners and non-profits. We have interviewed about a dozen representatives from churches and service agencies looking to buy adjacent land for community gardens, outdoor performance spaces, and other projects they hope will bless their neighborhoods. The process of buying any property can be daunting and intimidating, but the mission of the DLBA is to see lots purchased and re-activated by Detroiters as soon as possible. I’ve learned that there is some confusion between the function of the DLBA and that of the Wayne County Treasurer, the entity involved in foreclosing and auctioning homes, too often starting a process that evicts people from homes they’ve lived in most of their lives. It is also clear to me, that if not done with ample care for these long-term residents who have challenging financial situations, the Land Bank’s urgent mission to deplete their property holdings as soon as possible will tip the balance of ownership towards those with the most ability to pay quickly. Thus, the Land Bank must proceed thoughtfully and attentively if they are to ensure that Detroit remains a city that is truly for everyone, and not just people like myself who had the means to move back from Los Angeles and purchase a home. Tell us about your host company and your role in the organization. At my host company Teen HYPE, I serve as the Manager of Mission Advancement. Teen HYPE’s mission is to Celebrate Youth, Confront Barriers, and Build Bridges, and they do this in a variety of ways. Each year, the organization produces a stage production that shines light on a particular aspect of being a teenager growing up in the Detroit of today, so the play is written in large part by the students themselves. This year, our topic is the negative impact of long prison sentence on the families of the incarcerated, particular the kids. With my experience having served at the Prison Creative Arts Project at the University of Michigan, I was brought on board to help develop the curriculum and plan some events. We had learned that about 90% of the teens that make up the leadership of Teen HYPE are experiencing a parent or close family member either in prison or currently on parole. Where I grew up, just north of 8 Mile, this is definitely not the reality. So, we watched Ava DuVerney’s documentary The 13th, exposing the massive expansion of private, for-profit prisons in our country, and the troubling reality that slavery might be operating under a different disguise. We pondered the ideas of over-incarceration and over-policing of some communities. Ultimately, we asked: what are the emotional, social, and economic impacts on the kids who have to live in the reality of having a caretaker taken away? 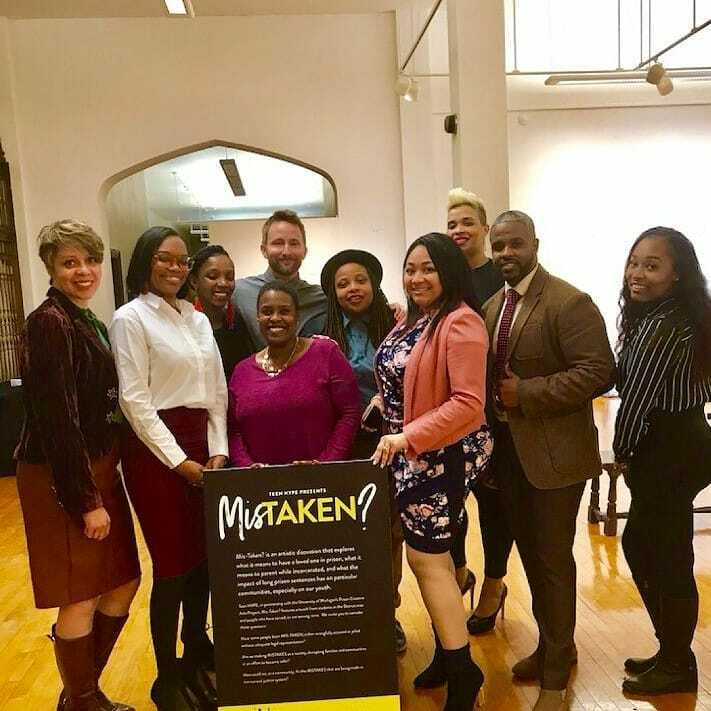 We invited students and people who are currently incarcerated to submit artwork for a gallery and community conversation, and this ultimately led to our stage production called Mis-Taken?, performed 5 times in early March of 2018 to roughly 4,000 student and community members. The response was overwhelmingly positive. Teen HYPE is doing critical work. I hope that while I’m here I can do my part to get the story out to both Detroit as well as the suburbs. I know full well how suburban folks often misunderstand my neighbors in the city, how that trickles down to expecting the worst from our local teenagers. These misunderstandings lead to ill-informed assumptions and continued disconnect, and this nudges people into making both political and everyday choices that continue to damage communities outside of downtown. I am living a very different reality, seeing every day how resilient and brilliant our teenagers are, how they have hopes and dreams and ideas that could truly move Detroit towards becoming the kind of city that sets an example for the rest of the country. I will continue to build bridges towards new perspectives and possibilities. What are you most looking forward to during springtime in Detroit? This will be the first spring in our new home in Pingree Park, so I’m excited to start planting vegetables in our backyard garden, to finish fixing our porches, and to start having neighbors and friends over. I am also looking forward to cheaper gas bills, as it’s been a really long and cold winter! How do you believe your fellowship will shape your career moving forward? 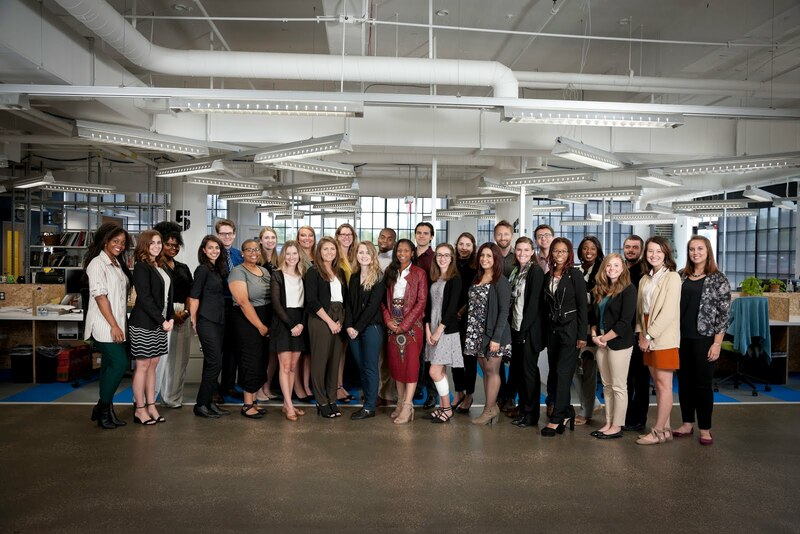 Challenge Detroit has provided me with a range of Detroit perspectives on business, politics, development and community activism. Just over half way through this fellowship, I am grateful for the stories and lessons I’m learning. I will continue to work on The Table Setters, the non-profit that Marvin Wadlow Jr. and I officially launched in 2016 to produce improved relationships across humanly created racial, socio-economic, political, and religious lines. We combine launch events in churches, schools, businesses, and civic institutions with customized plans for ongoing cultural accountability. We’ve seen that diversity training days are never enough, but that ongoing relationships that nurture connections and share brokenness, hopes and dreams, can be mutually healing and productive. Challenge Detroit has revealed to me, time and time again, how very true and critically urgent this is, what with the rancorous divisions in our city and country. I also sense that I will reconsider my call to ordained ministry, as this Fellowship has required me to take a significant break from my coursework at Fuller Seminary. I sense a growing call to community development, to continue learning how to really listen to people, story by story, and discern how to rebuild, or many times, build for the first time, trust between neighbors and neighborhoods in Detroit and the surrounding suburbs. I invite our white friends to join us in #RepentingofRacism throughout the 40 days of Lent by engaging in the habits and prayers we will post each day, the first several below, the rest can be found on Repenting Of Racism For Lent, on Facebook. The focus, #AntiRacismforLent, was inspired by our brother in ministry, Andre Henry, specifically asking white people to take on the mantle of educating other white people about the current state of racial injustice. 1) We invite you to pray with us. Prayer helps us self-examine and repent. We repent by asking God to reveal ways that we have allowed destructive, unjust (racist), circumstances to continue. We admit we have done so. We ask God to help us remove the conscious and unconscious white supremacy within our hearts and communities. Then, we ask God to remake us so that we can live differently. We encourage you to print the prayer we have attached to this post, and to make praying this prayer a daily habit throughout Lent. 2) We invite you to try on habits of justice. These are actions intended to help us advocate for racial justice in tangible ways. This week’s theme is #Prayer. Examples of future themes are #Politics&Power and #Communication. 3) We invite you to include community. Growth is best sustained when it is shared! On Fridays we will post an activity you can do with #Friends&Family, Saturdays will be for #DialogueDays, and Sundays will be for sharing how our weekly experience went, #CommunityConversation. By the grace and help of God, may this season of Lent change us all. God our Creator, We affirm that You have made all people in Your image, Instilling us with dignity, Calling us good. You created us in a beautiful array of colors, Each one, fearfully and wonderfully made. God, in overt and subtle ways, we have been taught a lie: The lie of white supremacy. The lie that white lives matter more than other lives. This lie denies Your image In our non-white brothers and sisters. We confess of consciously and unconsciously falling prey to this lie. Eternal God, we confess the sins of our ancestors. Ancestors who built systems to enrich and empower themselves on the backs of millions of people of color. They carried out genocide against indigenous peoples. They enslaved Africans. They used and abused immigrants. The list of injustices goes ever on. God, we confess to actively and passively maintaining a system that sins. It denies healthcare to the needy, Incarcerates at a profit, Unjustly shoots precious lives. When any of Your children suffer, our souls suffer too. We confess that we fear the cost of following You, O God: If we stand up for justice, Our reputation may suffer. If we stop ignoring cries of injustice, We will lose the illusion of innocence. Ending our sin of “no action” means we have to get to work. To “take up our cross” is painful. And so, God of Justice, we come to You. Reveal to us the unacknowledged racism within our hearts. Surface our unconscious preferences. Give us the courage to withstand honest self-examination. Give us the strength to fight for those who suffer.Give us Your vision of the community You designed us to become. God of Mercy and Hope, Convict our hearts, stir our spirits, transform our minds. May this transformation create a ripple that lasts beyond this Lenten season. May it extend beyond our personal lives and into our communities. Make us agents of Your liberating work in the world. – What moment was most life-giving or hopeful for you? Speak to God about this moment of consolation. What might God be inviting you to notice about yourself or the world? – What moment did you find most upsetting or concerning? Speak to God about this moment. What might God be inviting you to be, do or change? Write these reflections down to carry with you into the rest of the 40 days. Today’s #HabitofJustice is an opportunity to explore an experience of #WhiteGuilt* in a way that avoids burdening people of color. You may want to journal as you go through this contemplative exercise, or simply find a quiet place to reflect. Begin by taking a few deep, centering breaths. Now, call to mind an experience you have had of hurting a person of color. Picture this person sitting before you. Gaze into their their face. Imagine how they may be feeling. Now, imagine apologizing to them. Imagine the exact words you would say. Next, imagine telling them what you will do in this world to make amends. Finally, write down one specific change you can make in attitude or behavior to move toward more equitable relationships with people of color. The #HabitofJustice on this #DialogueDay is to engage in at least 15 minutes of discussion with another white person regarding what you’ve learned about yourself this week. What is one behavior or attitude which you are committed to change? Pay close attention to your own implicit biases, especially ones that frame people of color in negative ways, and how a system that favors white people over everyone else has made your life more comfortable. Rudy and Celah of Grace And Two Fingers, a show where “a Mexican and Black guy from the hood in Los Angeles talk about what Jesus has done and is doing,” invited Matthew & Marvin on their podcast with the question “why do Black and White people fight so much?” This blossomed into a rich and funny conversation about the intersections of faith, racism, “Whiteousness,” Jesus and the humor that can be found in the tensions when we keep coming back to the tables. Take an hour and dig in, you won’t be sorry.